Whether you need for your HILTI DSH 700, you have come to the right place. At Small Engines PRO Dealer, we carry an extensive variety of HILTI Aftermarket Parts including Belts, Air Filters, Carburators, and more. These high quality Aftermarket Parts are direct Original Equipment Manufacturer (OEM) replacements and fit a variety of HILTI Cut-off Saws. Below this information, you'll find a complete list of Replacement Parts for your HILTI DHS 700. By using the list on this section, it is much easier for you to find the specific product you are looking for. 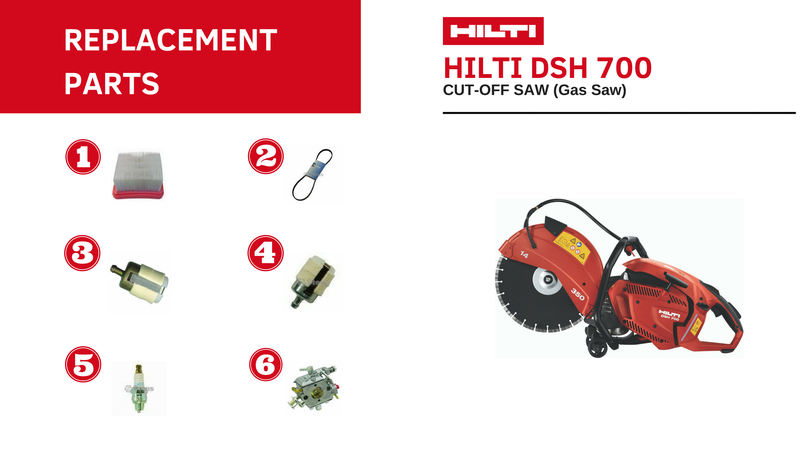 If you are uncertain on what product you need or are looking for your HILTI DSH 700, don’t worry! We have HILTI Techinicians ready to speak to you. Please email us at info@smallenginesprodealer.com and we will be happy to answer any questions. Also you can visit our Contact Section.